Margherita grew up in Milan. Her mother, Mariella De Natale, worked for Conde Nast for thirty years. Margherita graduated as a journalist and started working for Mondadori and more specifically for Grazia magazine. She later moved to L’Uomo Vogue and was guided by the wonderful Marco Reati. Throughout her fashion career she has travelled the world. In 1993 Margherita moved to London and quickly found her feet, becoming deputy fashion director of Harpers & Queen. In 2004 Margherita returned to her roots and Villa Metato opened in 2005. Villa Metato has been voted by The Sunday Times as one of the top 10 places to stay in Umbria and has been featured in The Wall Street Journal, Queen Magazine, Villa & Casali and several other prestigious publications. Margherita has a wealth of local knowledge. If you’re looking for that special day trip to Florence or Siena, Pienza, Cortona or Orvieto, just ask. 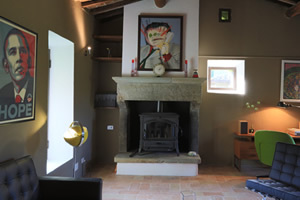 Margherita knows the best restaurants, can organise wine tasting, painting classes, private cooking classes, guided tours to view Italian art and architecture or cycling tours. She can suggest long lazy walks, secret antique shops and markets. Margherita has her little black book of information that will make your holiday a truly unforgettable experience. Villa Metato is a family business and a home. It’s unique style and environment makes Villa Metato and truly memorable place to stay. We look forward to welcoming you.